The Mesh Paint tool provides a method to directly apply one mesh layer onto the surface of another. For example, with the Mesh Paint tool, you can quickly drag a bolt along the hull of a ship or quickly brush many copies of boulders across a landscape. You can create actual geometry or mesh instances and can accurately place a single copy or apply hundreds of copies with a single stroke. To use the Mesh Paint tool, there must be at least two Mesh Items in the Item List. The currently selected item is the target of the tool and the background (visible but unselected) item is the source item applied onto the target. With this setup, you can drag across the selected Mesh Item and Modo applies the background mesh along the brush stroke. In the default mode, Mesh Paint applies a single copy of the background Mesh Item and slides it along the surface (Slide mode). 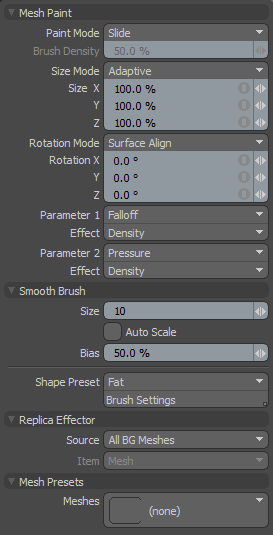 The Mesh Paint tool's Properties panel has options to modify the tool. You can invoke the tool from the standard toolbox in the Duplicate sub-tab. You can also choose Geometry > Duplicate > Mesh Paint. To create instances or replicas with Replicators, access the alternate Mesh Paint tool by clicking the existing Mesh Paint button. There are several modes that control how Modo applies the background Mesh Item(s) with each stroke. • Slide - Drags a single item over the target surface and positions it where you release the mouse button. You can also press Ctrl before clicking to interactively set the scale of the duplicates. • Strokes - Scatters multiple items along the brush stroke to clone many items across a surface with randomized placements. • Drop - Places a single item at the intersection of the pointer (when you click) and the target surface. You can drag to interactively scale and rotate the item. Determines the scale of the placed mesh duplicates onto the surface. • Random - Scales each duplicate randomly as determined by the X, Y, and Z values. 0% provides no variation; larger values increase the amount of variation. • Adaptive+Random - Combines the properties of these Size modes to add randomness to the adaptive scaling of cloned duplicates. Determines the orientation of the placed mesh duplicates onto the surface. • Surface Align - Aligns the target surface's normal facing direction with the up (Y+) direction of the cloned item. • Random - Rotates each duplicate randomly as determined by the X, Y, and Z values. 0° provides no variation; larger values increase the amount of variation. • Surface Align+Random - Aligns the item's up direction to the target surface's normal facing direction and then randomizes it away from that as determined by the X, Y, and Z values. • Surface Align+Tablet (no Pitch) - Ignores Pitch rotation (the Z axis), but otherwise is the same as Surface Align+Tablet. • Screen Align+Tablet (no Pitch) - Ignores Pitch rotation (the Z axis), but otherwise is the same as Screen Align+Tablet. Provide additional controls over the duplicated geometry by using a number of criteria. The parameters are the controlling factors; the effects of each determine what the relevant parameter controls. • Falloff - Uses a falloff. • Pressure - Uses the strength of the stylus' pressure against tablet. • Slope - Uses the slope (angle) of the target surface. • Altitude - Uses the altitude (height) of the target surface. • 1.0 Slope - Inverts the Slope parameter. • 1.0 Altitude - Inverts the Altitude parameter. Determines the aspect controlled by Parameter 1 or Parameter 2. • None - Affects nothing. This disables the Parameter. • Density - Controls the number of duplicates. • Size - Controls the scale of the duplicates. • Rotation - Controls the orientation of the duplicates. • Size+Density - Applies simultaneously both the Size and Density attributes. Smooth Brush - This is one of the standard brushes used in Modo for painting and sculpting. See the Smooth tool topic in the Sculpting section for details. Controls the area across which Modo scatters the duplicates and their initial density when placing elements with the Strokes mode. Larger brushes (in relation to the surface) spread duplicates across a larger area. When the Size mode is set to Adaptive, the size of the brush also affects the size of the duplicated geometry. Provides preset brush shapes to control the initial density of the duplicates. Determines how Modo treats instanced items in the Item List. • Off - Clones source item as additional instanced layers in the Item List. • Hierarchy - Creates a cascading array where each subsequent clone is a child of the previous clone. • Root - Creates instances as child items of the source mesh. • Primary - Creates Instances as children of a group locator that is parented to the source mesh. When enabled, the resulting instances display as bounding boxes rather than wireframe meshes. This may provide a 3D Viewport performance increase when Modo generates many instances. When enabled, clones any child items of the source geometry and retains their hierarchy through each subsequent clone. Determines the source mesh that Modo clones into the array. • Active Items - Uses the currently selected item(s) as a clone source. • Specific Item - Specifies a Mesh Item as the clone source based on the Mesh Item information. • All BG - Combines all the currently visible background items and clones them as a single mesh. • Random BG - Selects a random background item from all the currently visible background items at each clone position. • Mesh Layer Preset - Clones a mesh preset selected in the Preset Browser. Open the Preset Browser (by pressing F6) and select a mesh preset before activating the tool. Specifies the mesh to be cloned. This is only relevant if you set Source to Specific Item. The Mesh Paint Instance tool provides a method to directly apply a mesh instance onto the surface of a mesh layer. To activate the tool, right-click the Mesh Paint tool icon and select Mesh Paint Instance from the list. In addition to the Mesh Paint and Smooth Brush properties described above, the following properties are available for the Mesh Paint Instance tool. When enabled, each cloned item is an instance of the source mesh. Instances contain no physical geometry, but they reference a source layer and are represented in 3D Viewports by pink wireframes. This is enabled by default. Specifies the item to be cloned. This is only relevant if you set Source to Specific Item. The Mesh Paint Replica tool provides a method to directly apply a mesh replica onto the surface of a mesh layer. To activate the tool, right-click the Mesh Paint tool icon and select Mesh Paint Replica from the list. In addition to the Mesh Paint and Smooth Brush properties described above, the following properties are available for the Mesh Paint Replica tool. • Active Item - Use the currently selected geometry as the clone source. • Preset Shape - Clones a profile shape selected in the Preset Browser. Open the Preset Browser (by pressing F6) and select a profile before activating the tool. Opens the Preset Browser, where you can select a mesh preset to use as the Source.